Stop the Internet presses! 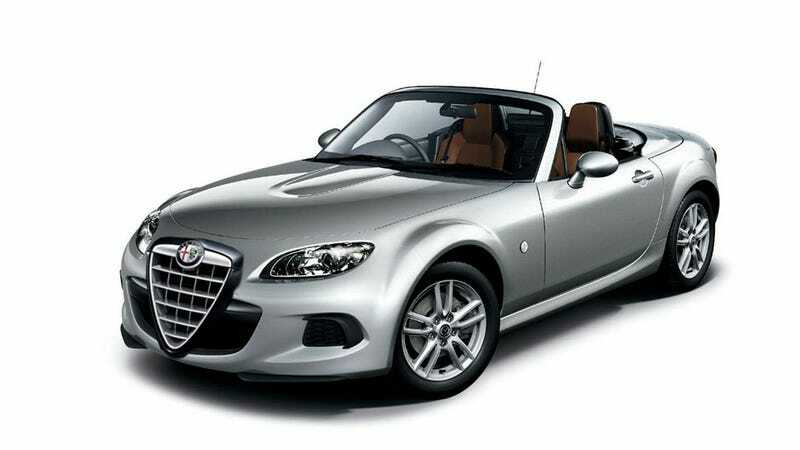 For the past two years, we've heard that the 2015 Mazda Miata's platform will also underpin a new Alfa Romeo roadster. Now we're hearing that Alfa's parent company Fiat might say "You know, we're gonna grab that one for ourselves, but thanks for playing." Automotive News Europe reports that Fiat, not Alfa Romeo, is now the more likely brand to get the Miata-based sports car. According to them — and this is news to me — Fiat-Chrysler CEO Sergio Marchionne wants no Alfas to be built outside of Italy as long as he's the boss, although he has declined to comment on the long-reported Mazda-Alfa platform teamup. The last we heard, the Hiroshima-built cars were to get their own engines, with the Alfa version to get a 1.4-liter MultiAir turbo engine out of the Fiat 500 Abarth. Sergio's Italy-only rule doesn't go for Fiats, which are built all over the world. AN Europe's sources say the roadster could wear the Fiat badge so the company can fulfill its contract with Mazda. There's also a possibility it could be badged solely as an Abarth, but that's contrary to earlier news that Abarth won't get its own standalone models. The planned 1.4-liter turbo-gasoline roadster probably would be too small and underpowered for supercar brands Ferrari and Maserati. That leaves the Fiat brand and Abarth. "Abarth really makes sense for a lightweight, small displacement, high-output two-seat roadster, which perfectly fits the brand's DNA," one of the sources said. Excited as I am for Alfa's return to the U.S., I think the Miata-based roadster would make sense with an Alfa Romeo or a Fiat badge. Both brands have a history of making great two-seat sports cars. This car would work for either of the two brands. The sources didn't say which other brand is the most likely to add the roadster. Fiat's other near-premium brand, Lancia, is not in contention for the car because Marchionne has decided to reduce the 108-year-old marque to a one-model brand, the Ypsilon, that only is sold in Italy. Lancia will be discontinued outside its home market starting this year. Make sure you pour one out for our homies Stratos, Delta and Flavia tonight.